Spinner Will Beer has signed a new two-year contract with Sussex CCC. The homegrown Horsham colt’s new deal will see him remain at The BrightonandHoveJobs.com County Ground until at least end of the 2017 season. Beer, who came through the ranks of Sussex’s Youth and Academy setup and has been with the county since the age of 10 has been an integral part of Sussex’s white-ball campaigns in recent seasons. He again was a mainstay of the Sharks’ side in both NatWest T20 Blast and Royal London One-Day Cup campaigns this year in between playing Sussex Premier League cricket with Horsham. The 27 year-old said of his new deal at Hove: “I’m really pleased. To be given another two-year contract by the club I’ve grown up playing for is fantastic for me. 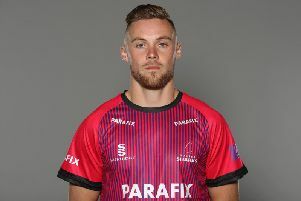 Crawley-born Beer has also been gaining experience away from Sussex, playing three matches for Oxfordshire in the Minor Counties Championship, thanks to the cricketing partnership between the two counties. He will be working with the England Lions squad this winter in Dubai in a net-bowling capacity. Sussex’s professional cricket manager Mark Robinson said: “Will has become an integral member of our one-day team, and should prove to be one half of an exciting partnership with Danny Briggs.